A new and very tiny sunspot is emerging near the sun's eastern limb. Credit: SOHO/MDI. NO AURORAS: A solar wind stream is blowing past Earth but it is having little effect. Auroras are unlikely tonight. 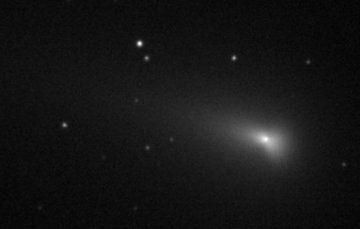 73P-C is the biggest and until now the sturdiest fragment of dying comet 73P/Schwassmann-Wachmann 3. While other fragments fell apart in recent weeks, fragment C held together. The suddenly pinched shape may signal an overdue breakup. Glowing like an 8th magnitude star, fragment C remains an easy target for big backyard telescopes. Look for it in the eastern sky just before dawn: sky map. DEWBOW: Not all rainbows are in the sky. 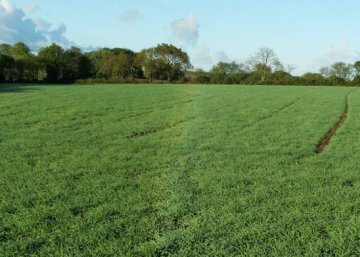 Look carefully at this field of grass photographed on May 9th by Laurent Laveder of Chateaulin, Brittany, France. Can you see the rainbow running faintly down the middle? In a second picture, Laveder caught a strange halo around the head of his shadow. This is caused by dew, too. It's called heiligenschein. You are visitor number 33945554 since January 2000.